Pat Metheny plays Guitar and Orchestrionics: pianos, keyboards, marimba, vibraphone,orchestra bells, basses, guitarbots, percussion, cymbals & drums, blown bottles, and other custom-fabricated acoustic mechanical instruments. 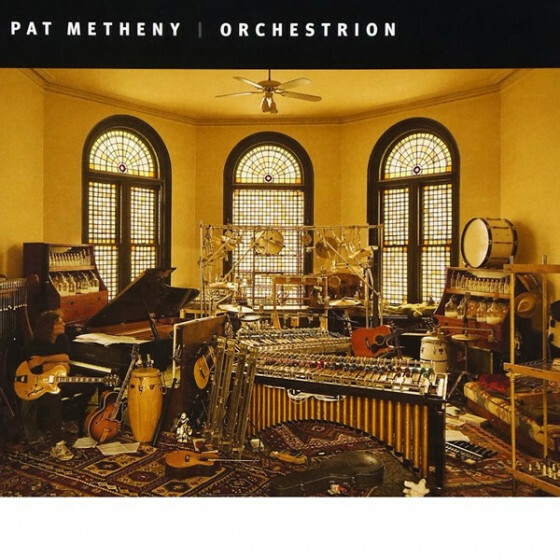 "Pat Metheny’s Orchestrion refers to a 19th century hybrid musical instrument of the same name that contained (usually) a wind orchestra, various percussion instruments, and sometimes a piano played by a pinned cylinder or a music roll -- like a player piano. Metheny designed and plays one here thanks to a commissioned group of inventors, advanced solenoid switch technology, and pneumatics. 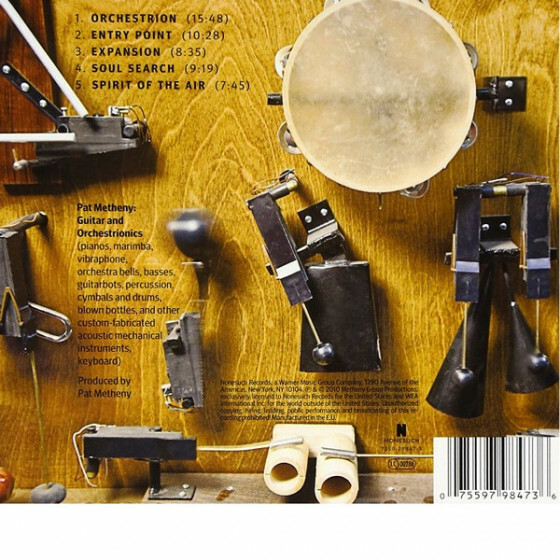 This invention includes pianos, marimbas, bells, basses, “guitarbots,” percussion, cymbals, drums, loads of tuned bottles, and synth and fabricated acoustic instruments, played by Metheny triggering everything with his guitar. While it may have been simpler using a laptop with the latest sampling and MIDI technology, he explains in the booklet that the “acoustoelectric” sound and the “human element” he sought would have been impossible to achieve. Here, his extensively written compositions are a complete engagement with his trademark harmonic and lyric investigations and improvisations. Despite mechanics, everything here sounds and feels organic. Drums and percussion instruments swing, basslines flow in concert with and counterpoint to his guitar and piano lines. These five cuts showcase different sides of Metheny’s compositional acumen and poetic sense of detail without losing his euphoric, spacious sense of complex harmonic engagement or songlike melodic sensibilities. Does it work musically? Check the title track and “Expansion"; their knotty changes hint at Steve Reich's work for mallet instruments, but their deep, warm guitar grooves, intricate melodies, and Metheny’s love of rhythmic invention set them worlds apart. These tunes flow seamlessly even though they are compositionally ambitious, even by Metheny’s exacting standards. 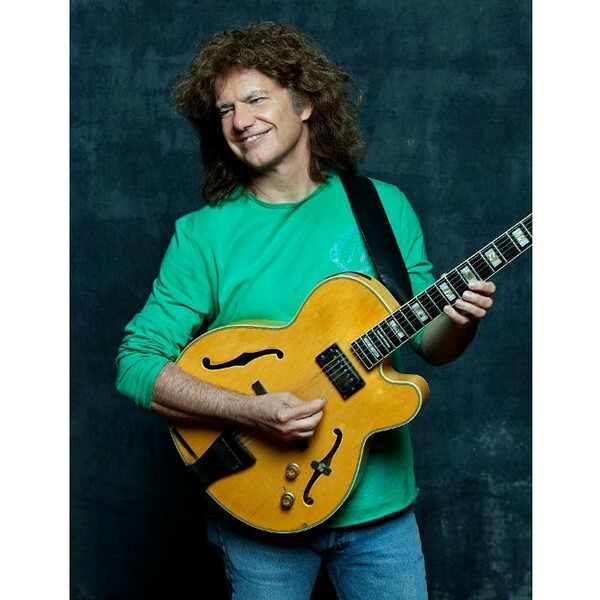 In places one can hear traces of Frank Zappa’s playful compositions in the keyboards and percussion instruments, too, but Metheny’s sense of swing is so pronounced it reflects pure modern jazz. “Entry Point” begins as a spacy ballad before evolving into a vehicle for rich solo guitar work and an engaging contrapuntal workout between mallet instruments, drums one side, and pianos and guitars on the other; the cymbals groove like mad throughout. “Spirit in the Air” closes the set. A bassline, cymbals, and hand percussion introduce it with a pulse; guitars and bells underscore it creating a foundation for its euphoric, songlike melody. It may be the most beautiful integration of this experiment's particular parts. As an album, Orchestrion is as ambitious as Secret Story and The Way Up, but it is no less brilliant. Here Metheny exceeds our expectations, and perhaps even his own."